Grand Opening 10:00 a.m. to 5:00 p.m. Please join us for a joint Ribbon Cutting Ceremony & Grand Opening at the brand new Parkland Health Mart Pharmacy located at 1131 N. Desloge Drive in Desloge on Wednesday, November 28, 2018. Parkland Health Mart Pharmacy would like to invite you to celebrate the Grand Opening of their new, beautiful location! 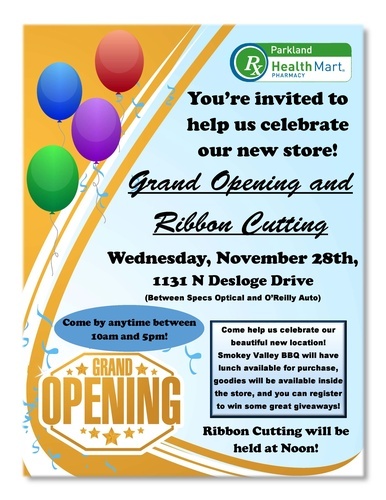 Stop by anytime between 10:00 a.m. and 5:00 p.m. Smokey Valley BBQ will have lunch available for purchase, goodies will be available inside the store, and you can register to win some great giveaways! Ribbon cutting to be held at noon!